Coronado Boys’ Rugby defeats Fallbrook High School, 33-22. On Saturday, January 19, Coronado’s rugby teams saw victories all around, starting with the boys’ win against Fallbrook High School. “A perennial rugby powerhouse in Southern California,” comments Coach Santos Trujillo, Coronado has maintained a convincing winning streak against Fallbrook and did not break that streak last Saturday. Due to a knee injury, AJ Sablan has taken over for Ben Cahill as the team’s starting scrum-half. Starting the game with scrum penalty on the initial kickoff, Sablan fed the ball into the scrum so that team captain Paul Fieweger could run through Fallbrook’s weak side to score the first try. From the far right, Juleon Weimann would follow with a conversion to take an early lead, 7-0. Fallbrook quickly responded with a forced turnover to score a try and a conversion, tying the game at 7-7. “Fallbrook was constantly getting push back throughout the day with strong runs,” says Coach Trujillo. After Fallbrook scored their first try, Mitchell Crowe had his first run of the day, passing it to Teddy Hendrickson, who pushed the ball further near the try line. 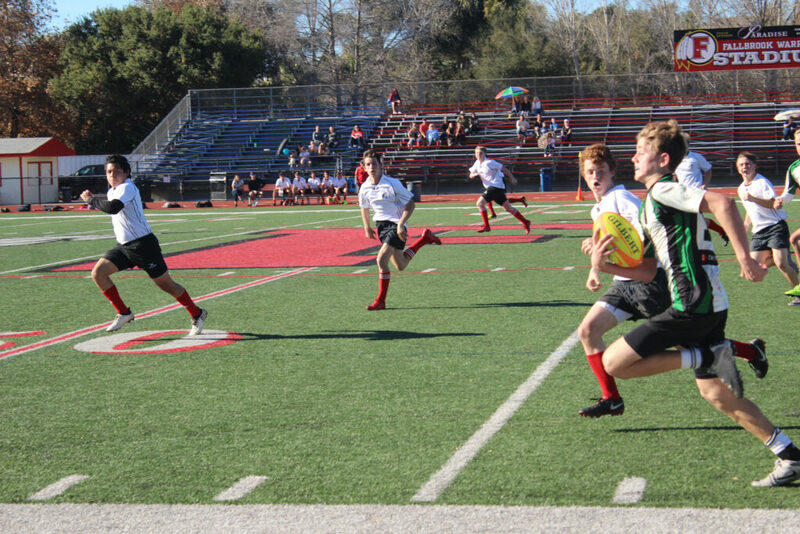 Coronado then conceded the ball, giving Fallbrook the opportunity to score the second try of the match to go up 7-12. Half-time was nearing, when their opponents gave up another penalty. Joe Williamson took possession of the ball in the line-out to go in for the last try of the half, leading 14-12. Outside Center Mitchell Crowe makes his first run of the match. The second half saw several small errors by Coronado, leading to many easy tries by Fallbrook. 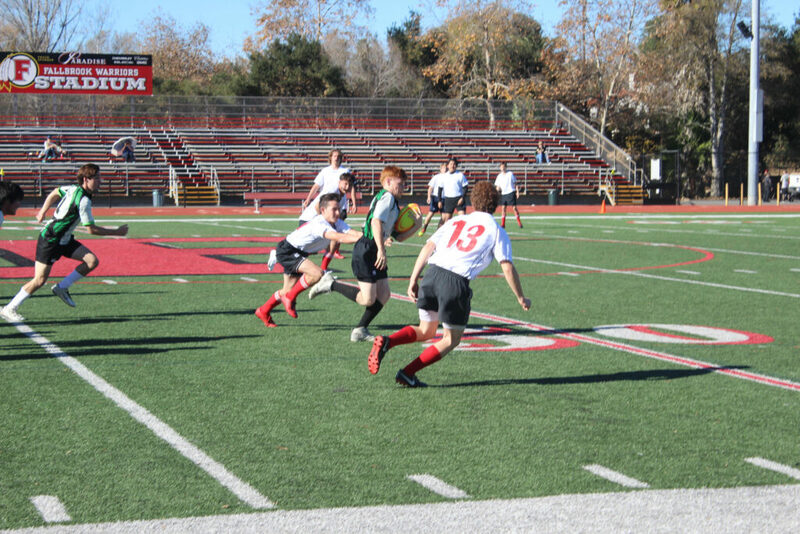 As a result of a small handling error on the initial kick, Fallbrook would then take the ball down for a try. “After a great first half, Coronado took a short nap on defense and suddenly found themselves behind 14-22,” shares Coach Trujillo. 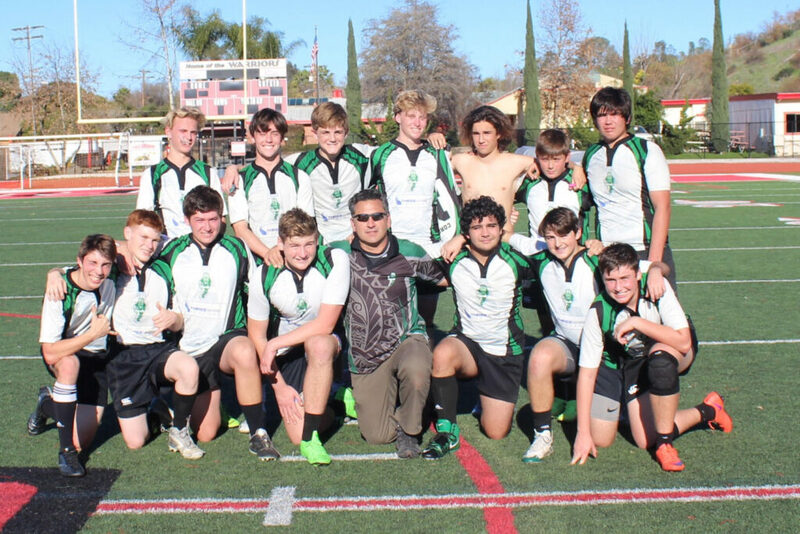 During the pre-season, Coronado adopted a new program as part of their training called Rugby Combatives. In other words, it is “the art of running with ball.” Outside Center John Cook put this training to use as he drove the ball through the sidelines, giving his best imitation of the “runaway train.” Fallbrook’s defense could not hold him off, and Cook made his first try of the season. Weimann completed the conversion, and the score was then 21-22. Outside Center John Cook makes a hard run to make his first try of the season. Coronado had ten minutes remaining to keep their winning streak against Fallbrook. Bobby Zajonc and Weimann had made several strong runs, taking apart their opponents’ defense. With Weimann as scrum-half, Coronado pushed back Fallbrook, giving him the opportunity to pick up the ball and run in for the try. With five minutes remaining, Coronado now led 26-22. Coronado High School Girls win all three matches against Valley Center, San Marcos, and Mission Vista High Schools. 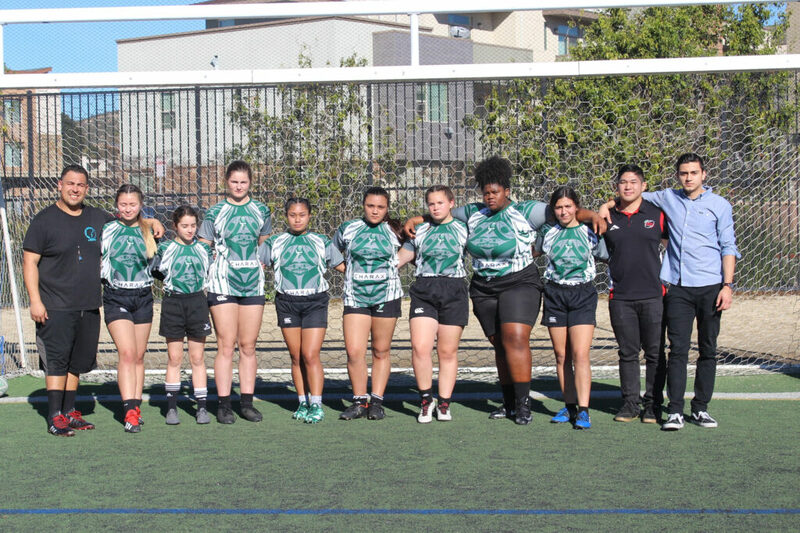 Last week, the Islander Girls’ Rugby Club played three matches, the first against the Valley Center Jaguars. This match started with a mis-cue from the Islanders’ defense, resulting in an early try by the Jaguars, 0-7. With four consecutive tries by the Islanders, the Jaguars’ defense became overwhelmed and were unable to score any further tries. The final score resulted in a 28-7 win for the Lady Islanders. This match warmed up the Islanders, as they next faced a more experienced San Marcos squad. The first half of the match proved to be even among both teams. Coronado started off with a try and conversion, leading 7-0; the San Marcos Knights quickly responded with a try of their own to tie the game at 7-7. Both teams went back and forth, as the score at half-time read 14-14. “The Islanders would come out even stronger in the second half scoring back to back tries and not allowing San Marcos to see the try zone,” comments Coach Trujillo. This gave the Islanders their second win of the day, with a final score of 33-14. Co-team captain Nessa Hudson gives the initial kick of the match against Mission Vista High School. Immediately after, Coronado played their final match against the Mission Vista Timberwolves. 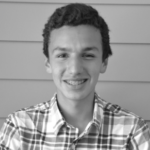 Although a little fatigued, their defense did not show it and proved very effective. Much like the Knights in the second half, Mission Vista did not see the try zone for the duration of the match. This left the Timberwolves scoreless, as the Islanders’ offense scored four tries and one conversion to win the match 22-0. Congratulations to both teams for excellent match play!